TOKYO BLADE is one of the special bands that comprise the highly esteemed NWOBHM scene. The act initially formed in the late seventies—previously using the monikers WHITE DIAMOND, KILLER and GENGHIS KHAN—and aside from two extended periods of inactivity following disbanding, the band has been kicking out the heavy metal jams for almost 30 years. Not every band can obtain the monstrous commercial success of the likes of IRON MAIDEN or JUDAS PRIEST, and though they came from an exclusive and seminal pack, TOKYO BLADE's star hasn't shined as brightly as those of the aforementioned juggernauts. The group should have received more widespread attention based upon the merits of its music; however, and there is a great deal to be said of the unit's tenacity. 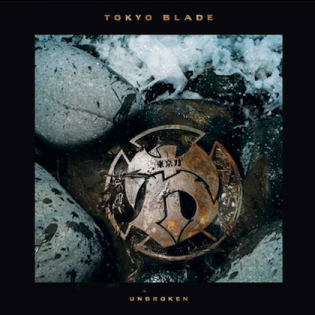 TOKYO BLADE's 2018 album, "Unbroken", serves that very point. The Brits never properly gained steam and built momentum because of its hiatuses, as well as common issues like lineup instability that plague so many bands. Since its second reformation a decade ago, founding member Andy Boulton has provided focus to the heavy metal titan, leading it to churn out a couple of LPs and a pair of EPs. For "Unbroken", Bolton rallied the troops as the lineup is stacked with original members: singer Alan Marsh, guitarist John Wiggins, drummer Steve Pierce and bassist Andy Wrighton. "Undeniably our journey has been a tough one and it's taken enormous effort to keep TOKYO BLADE alive. With the original lineup coming together, it's a very significant release, proving that we won't lay down and die," Boulton said in a recent press release, acknowledging the group's previous instability and bumpy road. "This is our eighth studio album and our third with the original lineup. We truly believe that this album should have been the rightful successor to "Night of the Blade" but fate had other plans." "Unbroken" is the first long player since 2011's impressive "Thousand Men Strong". TOKYO BLADE makes it apparent immediately that the members are not a bunch of worn-out old metal dudes going through the motions with the hefty and high-charged opener "Devil's Gonna Bring You Down". The veteran British band's feet remain firmly planted in the soil draping the roots of heavy metal that they were a part of establishing; however, there's a subtle yet obvious modern appeal that doesn't sound forced or unnatural. "Unbroken" is essentially a modern take on the classic NWOBHM sound from a collective that was there in the beginning. Andy Wrighton's tasty bass solo at the onset of "The Man In Black"—reminiscent of Geezer Butler's classic "Bassically" solo that kicks off BLACK SABBATH's "N.I.B. "—is one of the simple but effective ways that TOKYO BLADE keeps the songs on "Unbroken" sounding fresh and distinguished from one another. The track goes on to showcase an up-beat hard rock quality before a dark, ominous riff accompanies the chorus. Marsh's smooth, soaring voice is as powerful as ever, resting atop the instrumentation that's geared entirely toward songwriting and performance that's designed to convey passion. In stark contrast to an old-timer who either poorly regurgitates his former glory or embarrassingly attempts to gain relevance by awkwardly mimicking popular current styles, TOKYO BLADE succeeds with "Unbroken" because it isn't trying to be anyone but itself.